With the Audioboo iPhone app, you can record your musings, explore the perspectives of others, and share your audio recordings with friends. In a nutshell, it’s Twitter with real conversation. Each audio file is referred to as a “boo,” and, once you get over the initial shock of using that word in this peculiar context, you’ll be impressed with the chance to create and engage with your actual voice. The Audioboo iPhone app has fresh, smart navigation. You use your fingers to swipe across the categories on the screen–settings, browse, my boos, channels, messages, and contacts. Each category has a bright, bold icon to complement the function. You simply tap an icon, and you are transported to a new screen. The browse category is the home to your feeds. The feed is a list view with the profile photo, user name, and title. With a touch, you can listen to a boo. Or, you can press the list icon in the upper right hand corner to filter the feed. The list of selections pops onto the screen in a purple box–featured boos, followed boos, recent boos, trending boos, and nearby boos. It’s not a one-touch sort, but it has an interesting visual impact. The channels icon has an excellent break-down of the curated boo providers. You can select a category like news and entertainment, then you can customize your feeds. It’s a similar process to following on Twitter and ShowYou. The process of creating a boo is a snap. You can press record from the home screen, and you move to a nice recording screen. You can watch the volume, as well as the countdown from three minutes–the maximum amount of time allowed per boo for a free account. Just like Twitter, you tag it. You also name it and choose location. You can share with one touch to Twitter, Facebook, Tumblr, as well as send as SMS, email, or create an online link. If you care to share someone else’s boo, you can share in the same way. The current content for Audioboo is interesting. I found a teacher updating kids on their homework assignment. You can check out different boos from an arts competition. And, of course, you can find out all about Lindsay Lohan’s most recent arrest. Since you can search for boos near you, you can find interesting, local information. 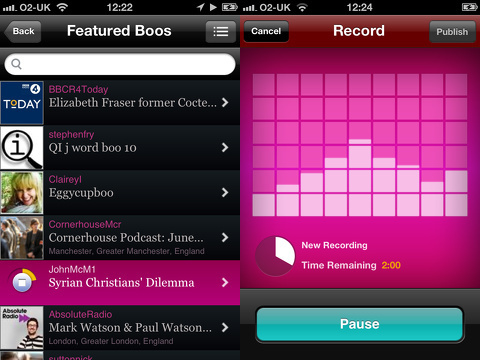 There are several extremely useful applications for Audioboo’s recording capability. It might be the perfect option for a salesperson to record a pitch, so that one-on-one connection remains strong with a client. I really appreciate the chance to send a Direct Message boo. I could do this all day with my husband. My thumbs get tired of texting, but a couple of touches to start and stop recording would be perfect. 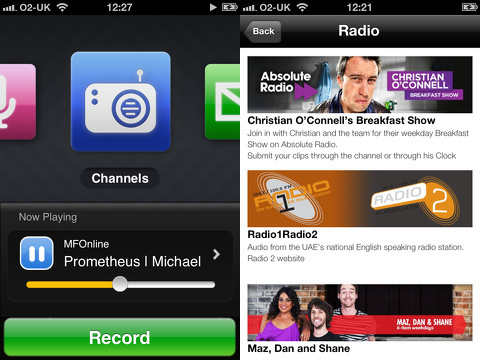 The Audioboo iPhone app is a pleasant surprise. It is easy, useful, and another opportunity to make social networks more personal. AppSafari review of Audioboo was written by Jenni Ward on September 23rd, 2012 and categorized under App Store, Free, Music, Social. Page viewed 3470 times, 1 so far today. Need help on using these apps? Please read the Help Page.